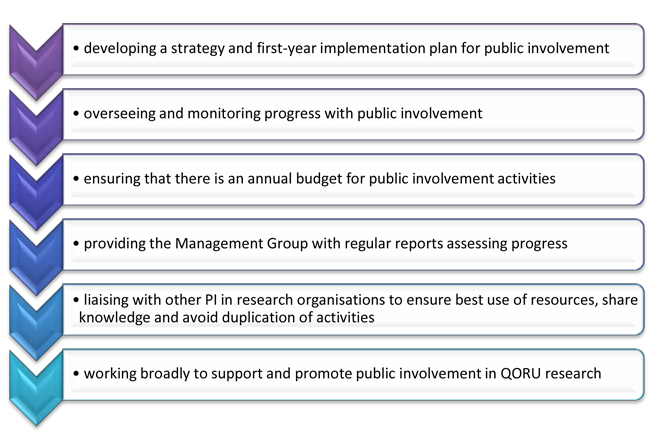 The PIIG has been established to develop, oversee and monitor the implementation of public involvement across QORU and includes management group representatives from QORU, researchers, members of the public, representatives from other Policy Research Units, and organisations with knowledge and expertise in public involvement in research, as appropriate (eg. INVOLVE). QORU has extended public involvement support to the Policy Innovation Research Unit (PIRU) – www.piru.ac.uk – a partnership between the London School of Hygiene and Tropical Medicine, London School of Economics and Imperial College.